When summer begins its approach, you often run to the store to buy plenty of ice cold drinks, ice cream cones, slushies or smoothies. However, the store bought is not always one of your best options. Plus, do you really want to be off to the store at night? Instead, you have the better option of making one yourself. From the comfort of your home, you can make your carnival, fair or shop favorites. With the best ice shaver machine reviews, you can know the best machine to buy and make your own snow cones, smoothies and slushie a healthy, tasty and nutritious option. With fresh fruits, fresh fruit juices, honey, coffee, the list is endless. But I can use my blender to crush the ice, you may say. Well, crushed or chopped ice may work fine to just cool your drink, but if you’re looking to have the fine, fluffy, perfectly shaped snow- like ice, a shaved ice machine for home is your answer. The best shaved ice machine for home will quickly shave down ice into fluffy, melt-in-your-mouth flakes, which when added to any drink, will cool it down and give it a little texture without making it too crunchy. You can also use the shaved ice to keep your summer salad chilled and fresh for serving. Whatever your desire, there is the perfect design for you, at an affordable price. To help you find the best shaved ice machine for home, we shall explore seven important factors to look out for in your search. The best shaved ice machine should be made of long lasting and sturdy materials, that won’t have you running for repairs or spare parts every so often. Stainless steel or brass for the blades is your best option. They are durable and do not require regular replacement, and they do not rust- which is dangerous. Consider too the body of the machine. Ensure it is not made from flimsy material, because you want a guarantee of longevity. Aesthetics may be a good feature, but do not allow this to overshadow durability. What’s in the package besides the ice machine? It is imperative to consider what extras come with the shaved ice machine. Some of these may include ice molds, sample syrups, straws and cups, which would allow you to test the workings of the machine as soon as you take it home. These accessories are not a necessity though, but can be considered an additional benefit. Instead of having to purchase additional accessories to use, they make your first time experience pleasant and hassle free. Making shaved ice should not be rocket science. It basically entails that you put the ice blocks, flip a switch, maybe push a handle, and the machine does the work. Maintaining and cleaning the shaved ice machine should also be simple and hassle free. After every use, running warm soapy water through and wiping it should be enough. In addition, removal and reinstalling of any moveable parts for cleaning should be easy. Cleaning the blades too should be simple, without the possibility of getting injured. It therefore should be simple for anybody to use after a run through the manual. The shaved ice machine should be efficient. The motor determines how fast it can produce ice shavings. Rating by the hour, a machine with a higher wattage would produce large amounts of ice shavings, faster. The higher the wattage, the more efficient it is in production. Higher efficiency from high horsepower also results in higher noise production by the machines. Consider this if you will require large amounts of ice shavings, meaning the machine runs for longer periods of time. Safety in using the shaved ice machine is of paramount importance. The machine should have an on/ off switch, with a waterproof shield. An automatic shut off feature provides additional safety in the use. This will ensure electrical accidents do not occur. The appliance should have a base made of non-skid rubber, to ensure it does not slip during operation. Additionally, a rubber shield to hold down the ice shaver ensures stability during use. If your appliance will be used by children, then your choice should be safe enough for them to operate. 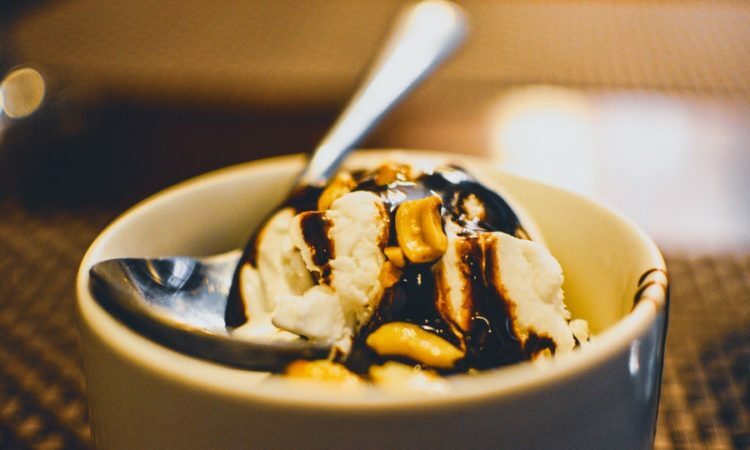 Consider that the shaved ice machine has warranty that covers defects or malfunctions in the machine’s operations, or any of its parts during its use, and the period of this warranty. An ideal manufacturer’s warranty should be unlimited for at least one year if purchased from the country of manufacturer, and three years if from a foreign country. 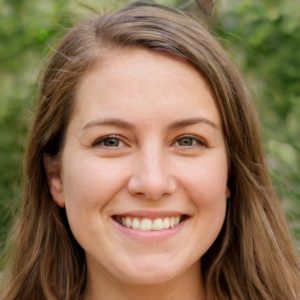 The warranty ought to have no additional cost, and should be valid where you make the purchase. Shaved ice machines have varying costs. The cost would be a reflection of the overall features. A basic machine with a low cost would be slow and less durable. It would also feature a low warranty period. One with enhanced features such as safety, water proof, stainless steel blades, high speed and highly durable, would cost more. It would also have a longer warranty period. After reviewing the important features to consider in your search, we present the best shaved ice machines for the year. 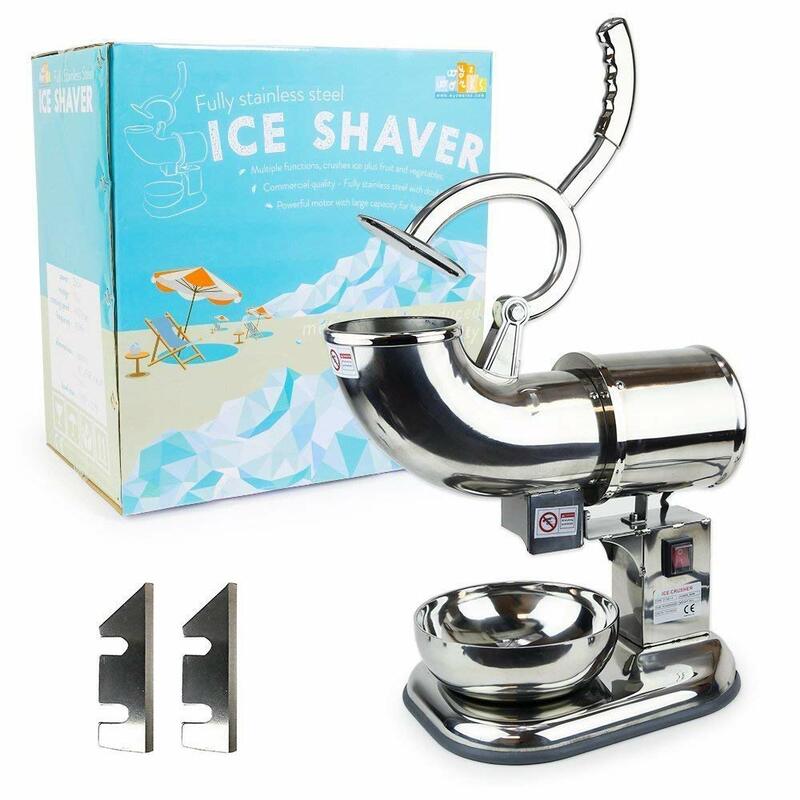 This vintage design ice shaving machine is not only eye catching, with its durable BPA-free plastic housing and everlasting stainless steel cutting blades, it will serve you for years. The rubberized wheels are not only a decoration, but provide the much needed sturdiness to its construction. Measuring 13.5 x 10 x 17.5 inches with a weight of 6 pounds, the Nostalgia SCM502 is a wonderful and convenient addition to you countertop appliances. To make your favorite snow cones, it comes with an ice scoop, and 2 reusable plastic cones that are held in a removable cone shelf. You can use ice cubes or bagged ice that will be shaved into fluffy snow in a matter of minutes. Fill in the ice reservoir with ice cubes, fix the lid, and turn it counterclockwise. The capacious container holds enough shaved ice for 20 snow cones. 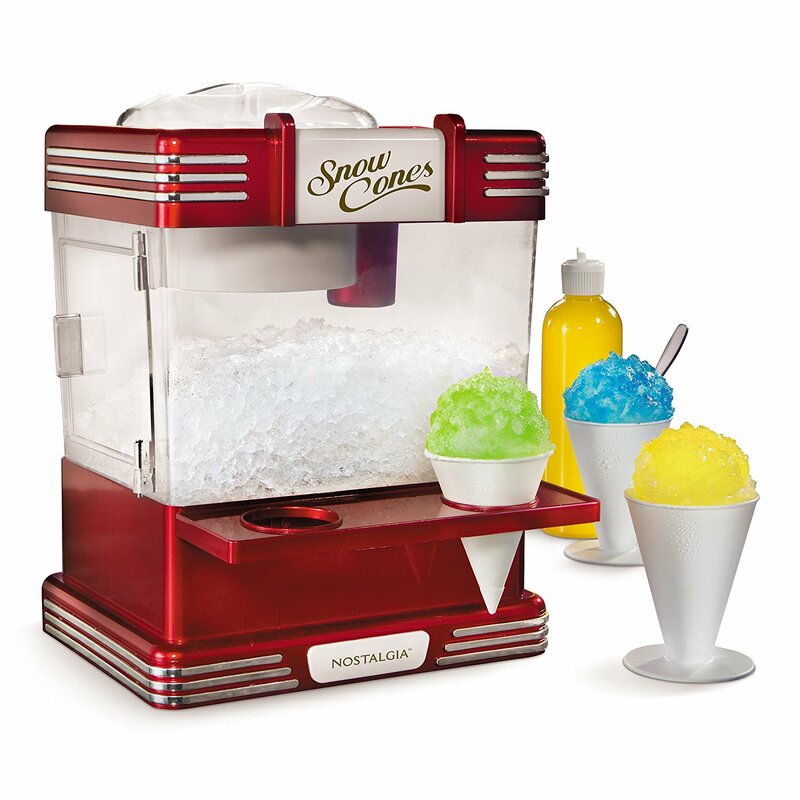 The Nostalgia SCM502 is quite an easy-to-use device, even children can handle it and make snow cones on their own. Is it safe? Nostalgia shaved ice machine is manufactured for high safety standards. Its operation will not begin until the removable lid is properly fixed in place, as the lid acts as the on and off switch. No injury can occur as there is no direct contact with the blades. Nostalgia SCM502 is a very efficient ice shaving machine. It produces over 75 lbs of fluffy snow per hour. This means that in 10 minutes of constant operation, you’ll have 25 snow cones (of 8 oz each). This appliance is designed and built by the manufacturer to provide many years of satisfactory performance under normal household use. It comes with a warranty on any defects in material or workmanship during the first 90 days of purchase. The Little Snowie 2 produces the closest thing you’ll find to the smooth fluffy shaved ice from your neighborhood snow stand without having to purchase a commercial shaver. With Little Snowie 2, you will be able to create perfect fluffy snow in just 3 seconds. The ice shaver is equipped with a replaceable 301 hardened stainless steel blade and a professional grade high-speed motor. No hand cranking is required, and the quality assures you of smooth ice shavings without crunchy ice chips. The texture of the ice is that of freshly fallen snow, fluffy and soft, melting in your mouth. The package comes with 6 free sample- sized bottles of flavored syrup in blue raspberry, tigers blood, sour grape, orange-pineapple, lemon lime, and pina colada. This allows you to launch your home made snow cones experience right away, without additional purchases. It also contains 8 machine washable “Snowie Shovel” party spoons. The shaved ice machine is very simple to use. You do not require custom shapes ice cylinders or cubes, ice cubes from the refrigerator or bulk ice cubes will do. 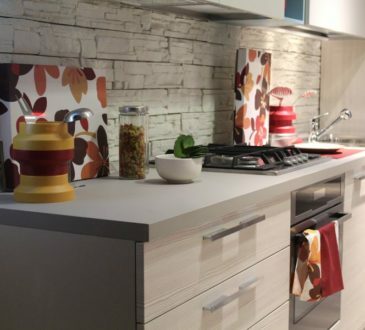 It is also simple to clean, carry, and with it sleek design, fits perfectly on your kitchen counter top. 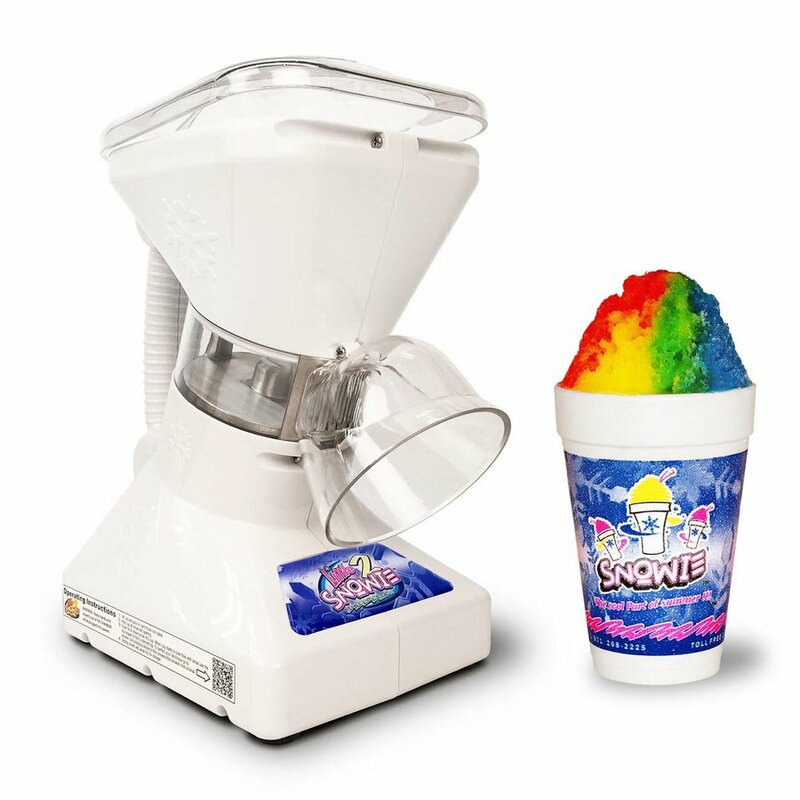 Snowie LLC, the world leaders in commercial shaved ice machines, has patented and engineered the Little Snowie 2 for home use, which comes with a no hassle 1 year warranty. Occasional leaking from left over ice. This ice shaver is ideal if you tend to prioritize the durability of the appliance above anything else. The all stainless steel built with an elegant sleek and smooth design, this is a sturdy and heavy duty ice shaver, designed for long term use if maintained correctly. The hopper, casing, stable base, blades and holding bowl are all stainless steel, which also make them hygienic. The WYZworks shaved ice machine is an ideal countertop appliance, weighing 13 pounds. Easy to use, you drop the ice into the hopper, push the handle, and the machine does the work. Ice bags or cubes should be able to fit through the hopper by ensuring they are approximately 3-4 inches in size. The shaved ice texture is snow like, and it can additionally shave fruit and vegetables. Simple to clean and maintain by flushing clean water through it, and towel drying. It comes equipped with an on/off switch, which has been shielded with a waterproof cover to help ensure safety for users. The unit also has a highly efficient motor of 200W, which can produce plentiful amounts of shaved ice – 440lbs in one hour! The stainless steel blades ensure you have the finest ice shavings possible. The S900A Shaved Ice machine packs compactly at 14.5 x 9.8 x 7.8 inches, and a weight of 8 pounds. Made of BPA-free heavy-duty plastic, it is pretty durable. Hawaiian Shaved Ice S900A is also pretty compact. You can unmount its parts and keep them away for more convenient storage. 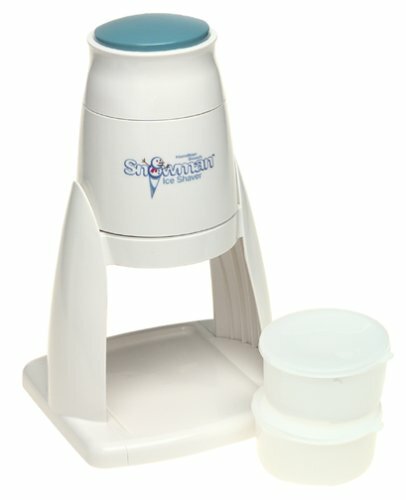 This ice shaver is unique as it produces both soft, snow-like shaved ice and crispy granulated ice. You can use it to make a variety of treats in addition to your snow cones, like desserts and cocktails, cold soups and milkshakes- all by adjusting the blade. 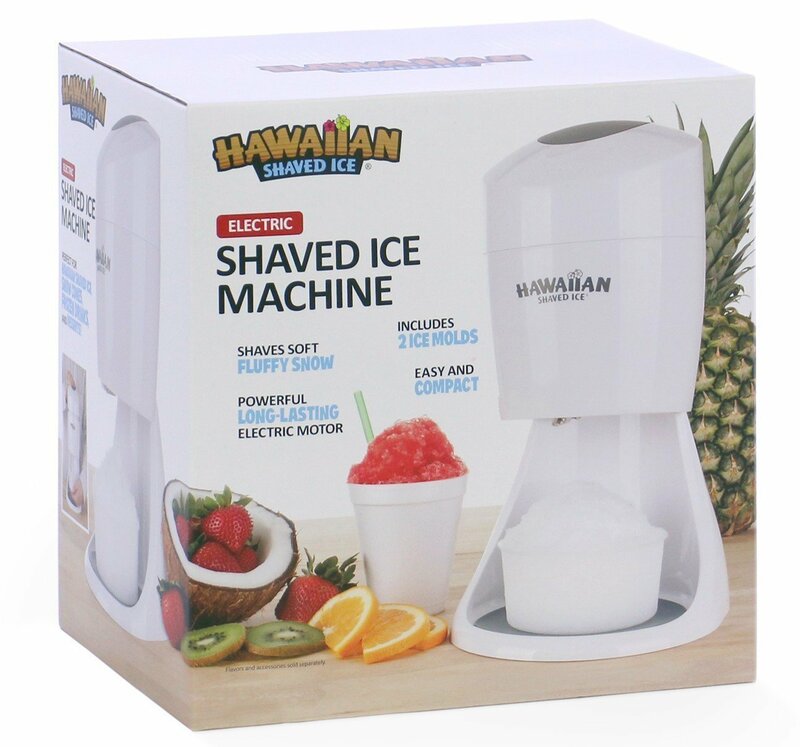 The Hawaiian Shaved Ice S900A shaved ice machine kit contains everything you’ll need for your party-the machine, snow cone cups, spoon straws, black bottle pourers to easily drizzle your syrup over the ice, and two round block ice molds. A non-skid tray is also included for safety and easy maintenance. This shaved ice machine is simple to use and maintain. Load ice cubes or ice blocks into a reservoir and press a button on the top to commence shaving. Once you stop pressing the button, the process will stop. The precision-cut stainless steel blade combined with cylindrical ice blocks ensures fine and fluffy snow for every serving. Compact size. Easy fit on kitchen counter top. Produces both snow like ice and granulated ice. Flimsy material in the structure and blade. Effort is required to make the shaved ice. A convenient counter top model, the Nostalgia Electric RSM602 Snow Cone Maker measures 2.5 x 10.5 x 15.5 inches and weighs 6 pounds that doesn’t take up too much space. The ice shaving kit has an approximate capacity of 20 (8 oz.) snow cones, and has a 360° clear-view chamber, which collects and stores the shaved ice before use. You can always see how much shave ice is left. Additionally, it includes 2 (8-oz.) reusable plastic cones and ice scoop. 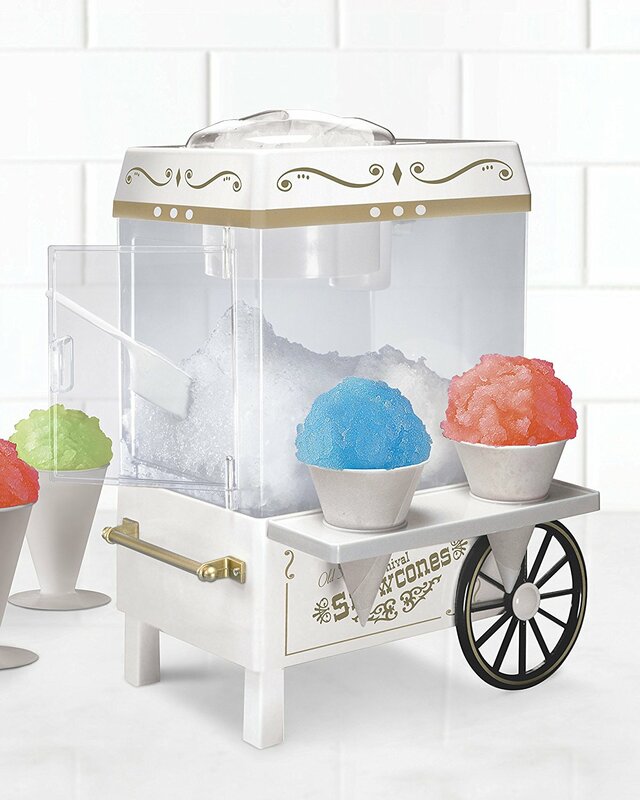 The built in cone shelf holds 2 snow cones at any given time, and has an easy access door for scooping shaved ice from the chamber, onto the handy cone shelf. A recipe list is included to enhance your experimental experience. The Nostalgia Electric RSM602 Snow Cone Maker is easy to use. Simply fill the top with ice cubes, secure the lid, and let the snow fly into the clear view chamber, and serve snow from it. Cleaning the unit is also simple, as the parts are detachable, allowing for proper cleaning and drying. The in- built safety switch makes it safe for children to operate, as it automatically switches off when the motor requires cooling. 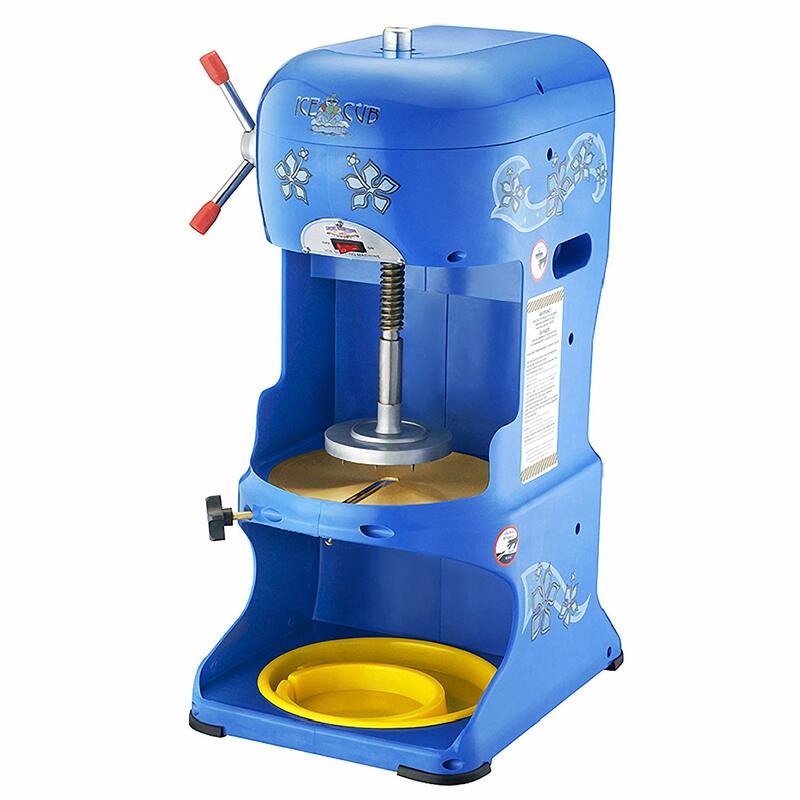 Nostalgia Electrics RSM602 Snow Cone Maker is protected by a product warranty of 90 days for manufacturing defects. This ice shaver is quite compact at 9.5 x 8.5 x 8.2 inches and weighing 3.2 pounds, small and light, it takes up very little room on your kitchen countertop, and is easy to move around. The ice shaver is constructed from plastic, with good quality steel blades, and produces a large amount of fine snow textured ice shavings. It is easy to dissemble for cleaning and maintenance. It comes with an 8-inch-square base which helps reduce the shaking when shaving, and two 4- inch ice molds with lids that are perfectly for freezing water, fruit juices or other beverages. 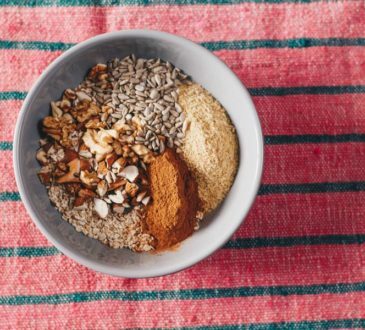 Additionally, it includes a booklet of recipes that you can sample using ingredients you readily have at home. It works great to produce soft powdery shaved ice for snow cones, smoothies and slushies. Hamilton Beach Ice Shaver is simple to use. Place the frozen round ice cubes (regular ice cubes will work, too, but not as well) in the blade unit, cover with the motorized top, and press down on the palm-size operating button. A bowl placed underneath, which is not included, catches the instant snow. It produces comparatively lower noise when operating. For your safety, the sharp blade is completely internal and therefore not accessible to fingers when the ice shaver is operating. Built according to ‘North American Electrical Standards’, a one-year warranty covers the ice shaver against manufacturer’s defects. Does not withstand constant use. The motor has to regularly be allowed to cool down. Does not include a bowl to collect the ice shavings. With Premium finish, high impact abs with brass and stainless steel construction, this 57.5 pounds heavy Great Northern Ice Shaver is definitely not a light kitchen appliance. It is a thoughtfully engineered ice shaver which boasts of stainless steel blades that are adjustable and last a lifetime, and an industry leading 1/3 HP motor that operates at 1725 RPMs. All these powerful features enable the unit to produce more than 350 pounds of ice in just one hour. The unit comes with a protective shield, and be warned, this unit is not safe for children to operate unsupervised. Being a commercial grade ice shaver, the Great Northern Ice Shaver is backed by a 1-year warranty for a worry-free buying experience. The collecting bowl is insufficient in size compared to the quantities of shaved ice produced.. You have to improvise. 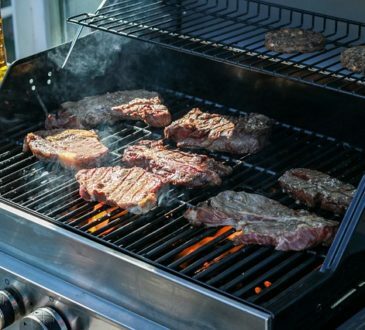 It greatly outclasses all other machines – it has a durable construction, is functional, hygienic, safe, and elegant and fits well into the kitchen setup. It is also highly efficient, producing large amounts of shaved ice within a given time, and not requiring you to hold it down to do its work of shaving. The mid- price range is also value for money. Choose the best machine for you and enjoy your delicious shaved ice cones!